As you may know, a qualified charitable distribution (QCD) is a payment made directly from an IRA to an organization that is eligible to receive charitable donations. Although the Protecting Americans from Tax Hikes (PATH) Act made QCDs permanent in 2015, there are specific requirements and circumstances that must be met before an IRA owner can make a QCD. To help you understand the ins and outs of this charitable distribution—and be a go-to resource for your clients—I’ve compiled the following common questions and answers about QCDs. Q: What Are the Tax Benefits of a QCD? A: Generally, regular IRA distributions are considered income for the IRA owner and are taxable. Qualifying amounts that clients donate as a QCD, on the other hand, are excluded from their taxable income. As such, they can use QCDs to lower their taxable income and, perhaps, their tax bill while benefiting a cause important to them. Q: Can an Individual Make a QCD and Take a Charitable Deduction? A: Although the QCD amount is not taxed, it cannot be claimed as a deduction for a charitable contribution. A tax advisor can help clients determine whether a QCD or a charitable deduction provides the most benefit based on their situation. Q: Who Is Eligible to Make a QCD? A: To be eligible to make a QCD, the IRA owner must be age 70½. Further, the distribution must be made on or after the date he or she reaches 70½. Q: What Is the Maximum Distribution Amount? A: The maximum allowable amount per year that can be distributed as a QCD is $100,000. Any amount above and beyond $100,000 distributed as a charitable donation will not be considered a QCD and will not qualify for the tax benefit under the QCD provisions. Note: For married taxpayers filing joint tax returns, $100,000 can be donated from each spouse’s IRA. Q: Can More Than One QCD Be Made per Year? A: Yes. As long as your client is eligible, there is no limit on how many QCDs that can be made. Just be sure that the total amount of the distributions does not exceed the $100,000 annual limit and that the distributions are made by December 31 of the year of distribution. Q: Can QCDs Be Used to Satisfy Required Minimum Distributions (RMDs)? A: Yes. QCDs can be used to satisfy RMDs. Q: Can a QCD Be Made from Any Type of IRA and Retirement Account? QCDs cannot be made from active retirement accounts that the client may have with his or her employer (e.g., SEP IRAs, SIMPLE IRAs, or qualified retirement plans, such as 401(k)s and 403(b)s). One exception to this rule is for non-active SEP and SIMPLE IRAs; QCDs are available from SEP and SIMPLE IRAs, as long as the plans have been terminated with the employer. Under certain circumstances, a QCD may be made from a Roth IRA. Roth IRAs, however, are not subject to RMDs and distributions are generally tax-free. So, your clients should consult with a tax advisor to determine if making a QCD from a Roth is appropriate for their set of circumstances. Q: Are Special Processing Requirements Involved? A: Yes. To qualify as a QCD, the payment must be made directly from the IRA to the charity. So, when issuing a check from the IRA, the check must be made payable to the charity. The funds cannot be distributed to the IRA owner, for example, and then later donated as a personal check. Typically, the check is mailed directly to the charity. In some situations, it can be mailed to the IRA owner’s address who can then send it to the charity (again, as long as the check is made payable to the charity). Q: Are All Organizations Eligible to Receive IRA Payments Made as QCDs? A: No. The receiving charity must be a 501(c)(3) organization eligible to receive tax-deductible contributions. Some of the charities that do not qualify include private foundations and donor-advised funds. Best practice is for your client to confirm with his or her tax preparer or with the organization to confirm eligibility before making the distribution. Q: How Are QCDs Reported on Tax Documents and Tax Returns? A: All distributions taken from the IRA will be reported on the Form 1099-R issued to the client and to the Internal Revenue Service (IRS). Here, be sure your client is aware that there is no special coding on this form that designates a distribution as a QCD. 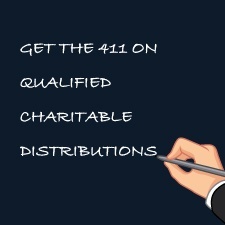 Enter the full amount as a charitable distribution on the line for IRA distributions. On the line for the taxable amount, enter zero if the full amount was a QCD. Then, enter "QCD" next to this line. Note: The charitable organization may provide the client with a receipt for the payment, which can be included with the client’s tax filing as proof of the donation. Q: What if the QCD Is Made from an IRA Consisting of Both Deductible and Nondeductible Contributions? A: Distributions made under the QCD provisions will be made from the deductible (pre-tax) portion of the IRA before the nondeductible (after-tax) portion. Of course, these are just some of the questions your clients may have about QCDs. But by educating yourself on this and other charitable giving strategies, you will be well positioned to help your clients both reach their charitable goals and reduce their taxable income. What other questions have your clients asked about QCDs? Are there other charitable giving strategies you recommend to reduce taxable income? Please share your thoughts with us below!